Best memory in ladies football: Winning the Junior B Championship final against Kilcullen in 2011 (my first adult success). And any of our final wins to be honest. You have to enjoy them when they come around and the craic back in the GAA is as much a part of it as anything. Sharing them moments with such a great bunch of girls is a special time. 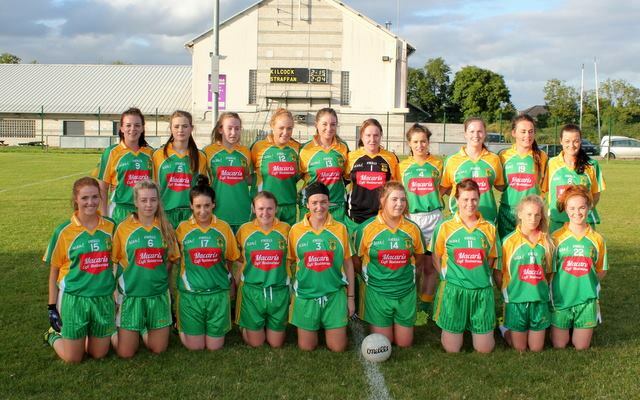 Worst memory in Ladies Football: Losing to Naas by a point in the Junior A Championship final 2012, that one still hurts. Advice for younger players: “Pass the ball to me.” laughs. Ahh no work hard in training, listen to your mentors, enjoy your matches and if some part of your game needs improving, work extra hard on it. Best manager worked under: Robert Cox, his knowledge of the game and attention to detail are second to none and he always has his training sessions so well planned. Facebook, Twitter or Instagram: Think I’ll have to go with Facebook on this one. What song would you like to be playing as you run out onto the field: Got to be Eye of the Tiger. Any superstitions before a game: Gota pee at least twice before leaving the changing room!! Emma seen here (front row, 3rd from the righ)t with her Kilcock teammates.